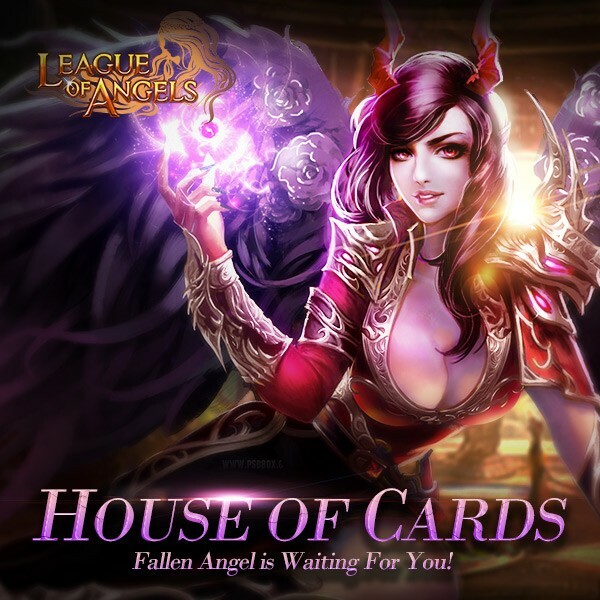 LoA_House of Cards: Get Fallen Angel and More! - You can swap the required cards for: Valentina, Fallen Angel, Yasi Delaney, Amazon Hawker, Poseidon, Mountain God, Dragon Queen, Dragon Empress, Dark Paladin, Headless Horseman, Ghost Paladin, Earthshaker, Amazon Hunter, Hecate, Lvl 12 HP/PATK/MATK/Agility/Crit/Dodge/Block/MDEF/END/Hit Gem, Lvl.8 Dodge+Hit Gem, Lvl.8 Crit+Hit Gem, Blessed Stone, Elemental scroll, Magic Socketing Rod, Spring Of Wisdom, and many more! - Total Ranking Rewards: At the end of the event, the Top 20 players with at least 20,000 total points have a chance to win Joker1, Dragonsoul Tamer Card, Lvl. 8/7/6 Fusion Gem Chests. More exciting events are coming up through Aug 11 to Aug 13 (Server Time), check them out in the in-game Hot Events menu now!